Grate the zest from the oranges. Remove the rind and all of the white skin with a sharp knife. Cut out the segments and squeeze all the juice into a bowl. Grab a shallow non-metallic dish, stir the Taco Spice Mix in with a dash of oil, the orange zest and the juice, keeping a couple of tablespoons of the juice for later. Tip in the lamb fillets and coat them in the mixture. If you have time, leave to marinate for 2-3 hours. Fire up a griddle pan or BBQ to a medium heat and sizzle the lamb fillets. 5-7 minutes for medium and 7-10 minutes for well done, turning occasionally and basting with any remaining marinade so that they’re all lovely and coated. Leave the lamb to rest for a couple of minutes, then slice into thin succulent strips. Throw the beans, red onion and herbs in a bowl with the orange segments and the rest of the orange juice and mix it up. Warm the Flat Bottom Taco Shells according to the instructions on the box. Get the lamb tacos on a big plate with the mixed beans, tangy salsa and cool sour cream sideon the side and let the whole house have at them. Take a taco shell, make a bed of spinach then top with some mixed beans. 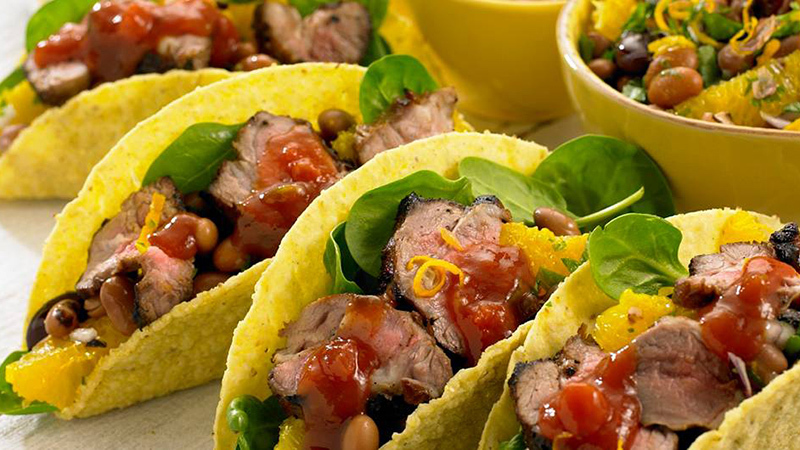 Throw in a few slices of succulent lamb and a dollop or two of our Mild Taco Salsa.